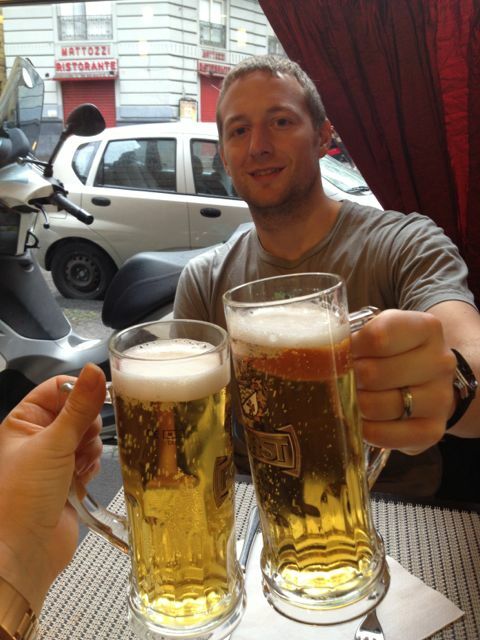 We just got back from our final trip to Europe mainland, well at least our final trip during our secondment. Hopefully we will come back to Europe in the future for more travel adventures. 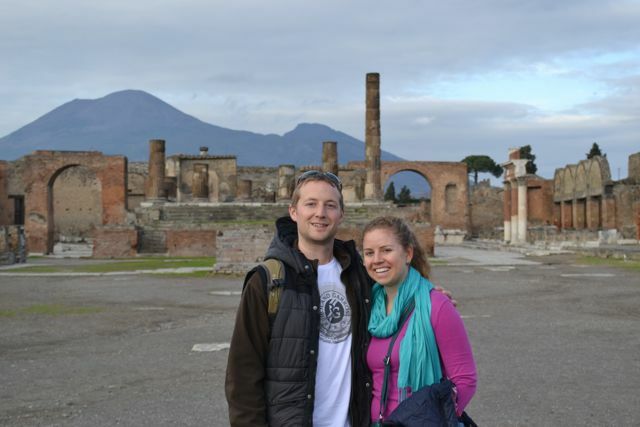 We took a long weekend and headed down south to Italy. 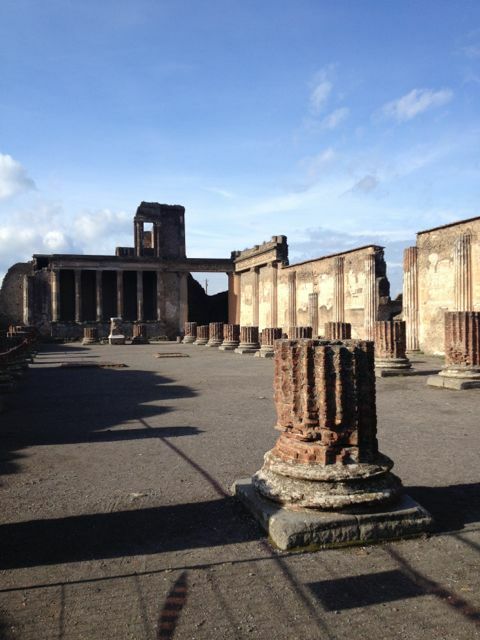 We stayed in Sorrento, but divided our time in Pompeii, Herculaneum, the Amalfi coast, and Naples. Italy map. 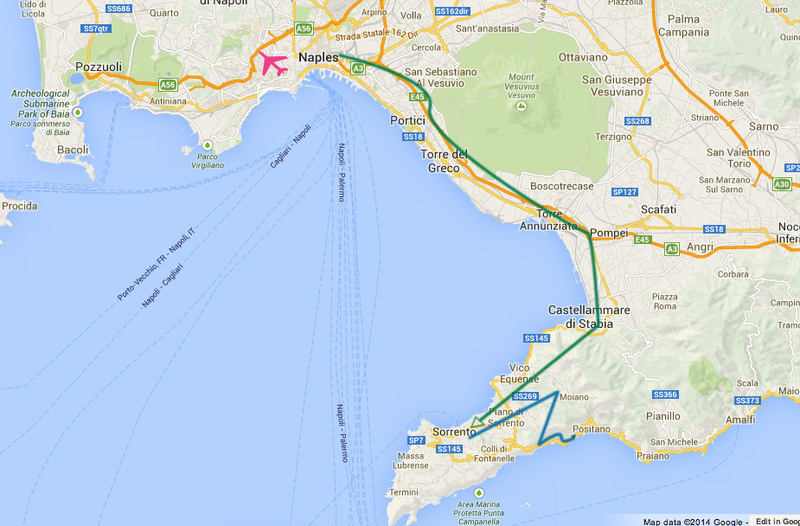 Green line is the train line from Naples to Sorrento, and the blue line is the bus tour along the Amalfi coast. 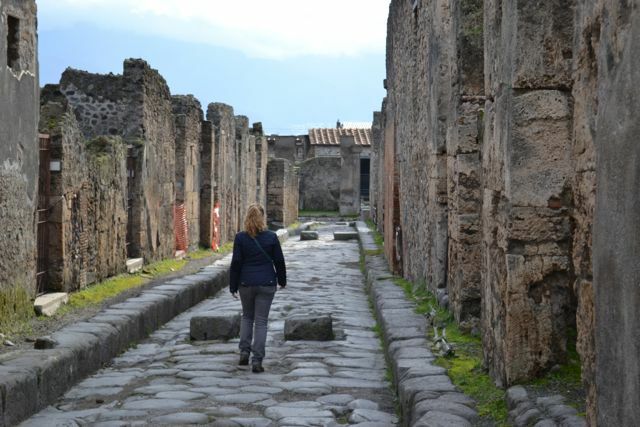 This was one of my favorite trips and also on my bucket list because I’ve wanted to visit Pompeii ever since my first Latin course back in 7th grade. 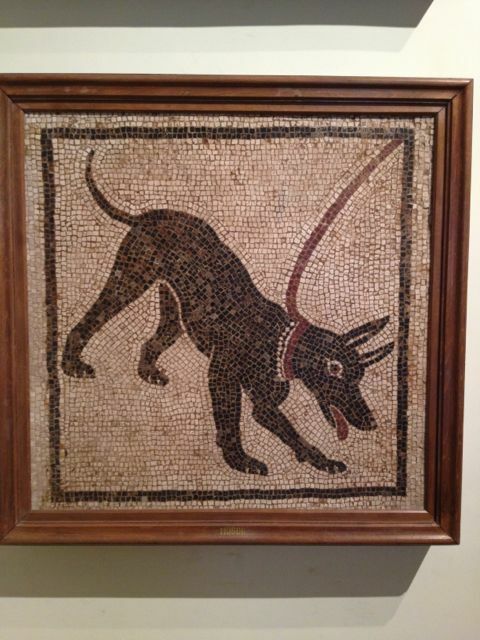 Magister Brandenburg taught my middle school class from the Cambridge Latin Course, which taught the basics of the Latin language by following the story of a Roman family (and their dog Cerberus) going about their daily lives in the shadow of Mount Vesuvius around 79 AD. 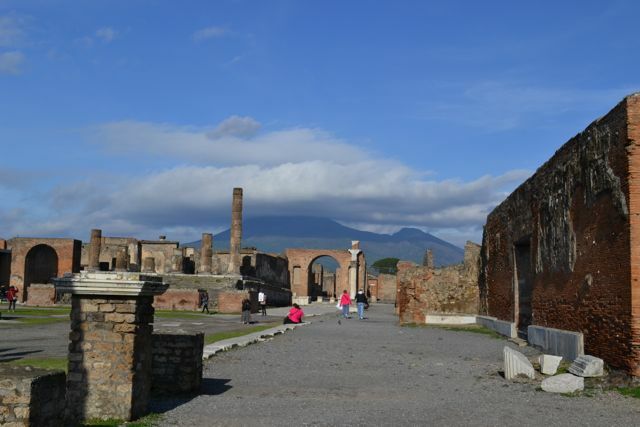 At the end of the book, Mount Vesuvius erupts and we all know the rest of the story. 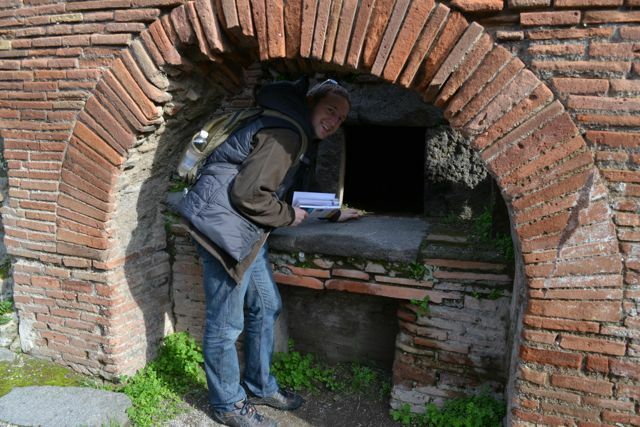 This initial Latin book and the story of Pompeii must have really captivated my 12 year old mind because I went on to take 5 more years of Latin and also competed on my high school Latin team (should I be sharing this information?). We don’t need to expand too much more into my Latin nerdness, but let’s just say that I was slightly obsessed with Latin for awhile, but thankfully my love for science and math prevailed and I went into engineering and not the Classics. It probably could have gone either way though for a little while. 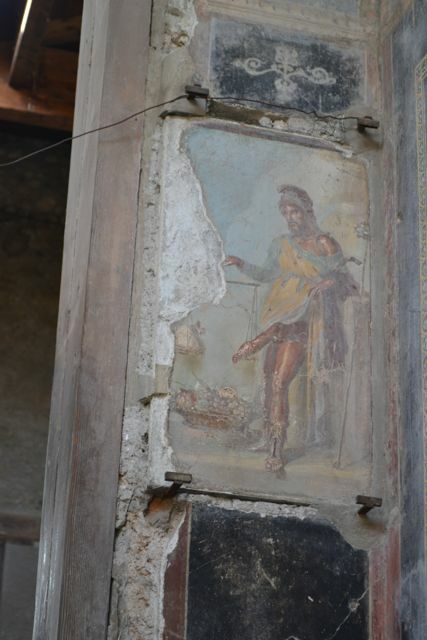 But that is the background as to why we simply had to go to Pompeii during our time over here. 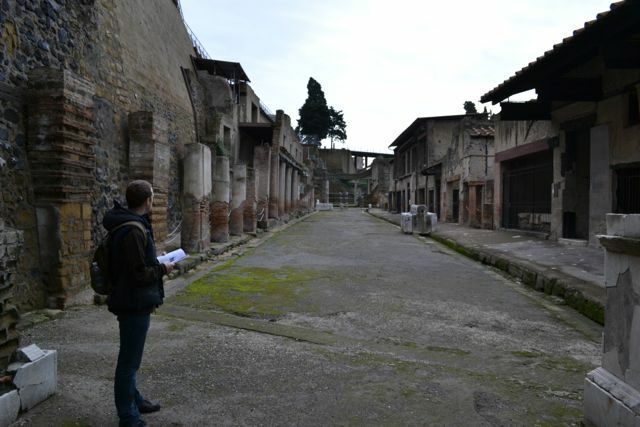 Doug was against going, saying he didn’t see the appeal of a ruined city, but eventually I convinced him, and I think even he was impressed with Pompeii. 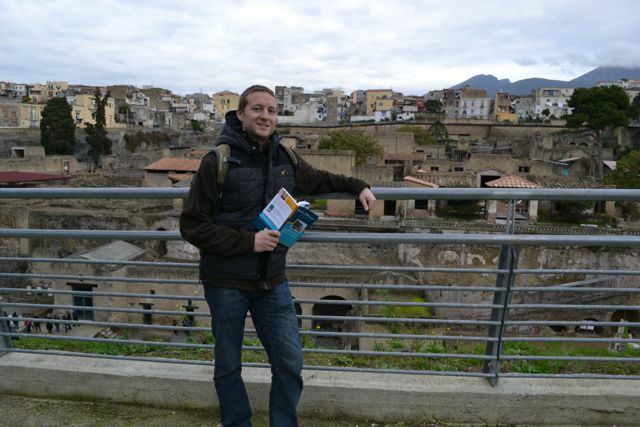 Unfortunately, I have lost most of my Latin skills, it being at least 10 years since I’ve studied it, but I still really enjoyed seeing the ruins. So on to our travel adventure. We arrived in Naples airport on Thursday evening, and by luck we managed to get on the last bus from Naples to Sorrento for the evening. We had some difficulty finding the bus (located outside the departures – and not arrivals – gate for those interested), but luckily we found it with one minute to spare. 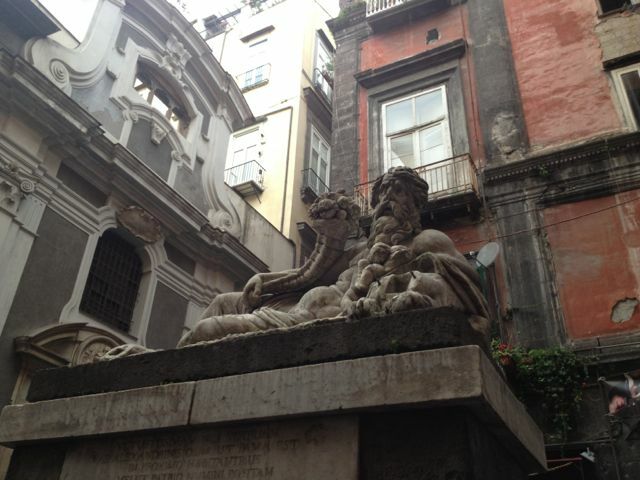 If we hadn’t caught the bus, we would have had to take a different bus to the Naples train station and then get the train from there to Sorrento. 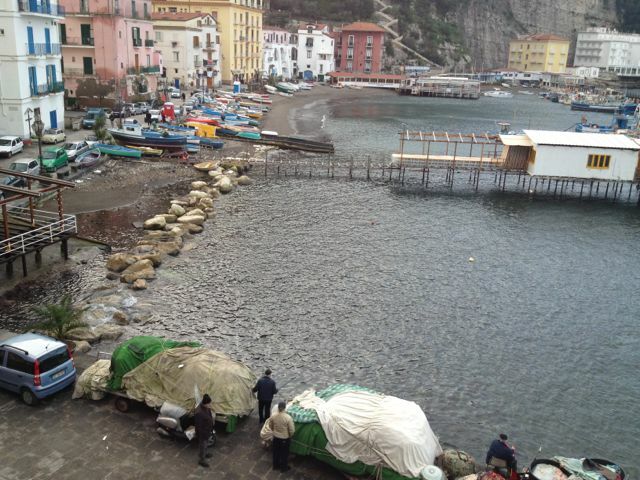 Instead, we had a little over an hour coastal drive to Sorrento. After checking into our B&B (complete with Apple TV and free wifi! 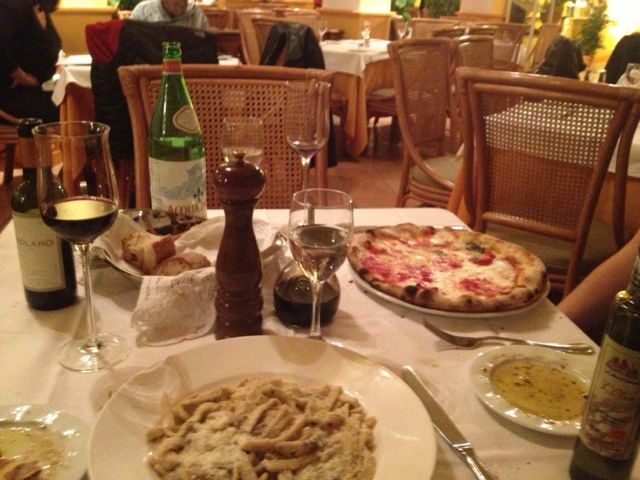 ), we went out for aperitivo and dinner. If you remember from Doug’s previous blog post from Florence, aperitivo is sort of like happy hour as it is pre-dinner drinks. 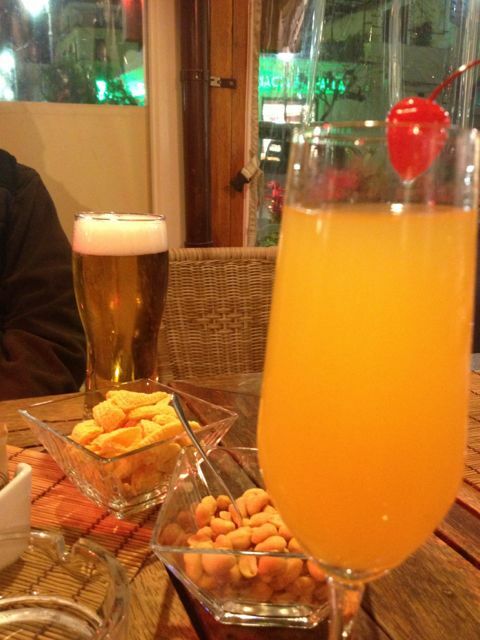 Luckily, we skipped the typical bitter cocktails (we already know we don’t like those) and went for a beer and a Bellini. 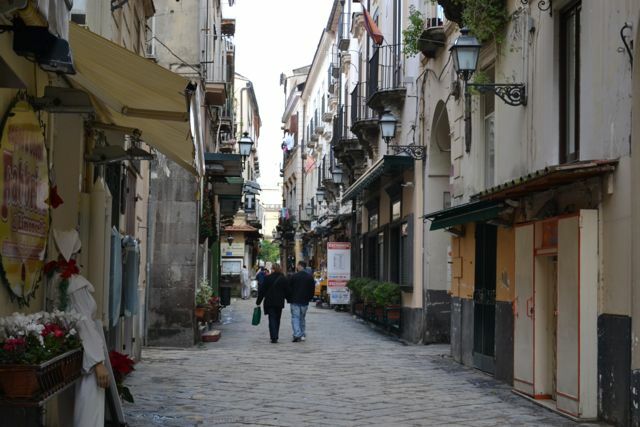 Sorrento was a really lovely city and a great place to stay to explore the region. We were there in the off-season, so there were a lot of restaurants, shops, and cafes that were closed, but you could tell that it had a really nice charm. The weather was around 52F (11C), which felt warm in the sun, and there were tons of lemon and orange trees lining the streets. 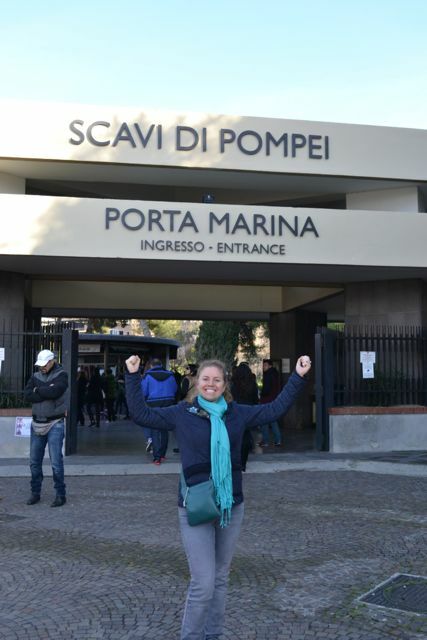 The Circumvesuviana train line goes from Naples to Sorrento, with Herculaneum and Pompeii as stops along the way, and there are ferry boat and bus connections, making it an ideal home base. That evening we started our weekend of carb-loading with pizza and pasta, followed by gelato dessert. 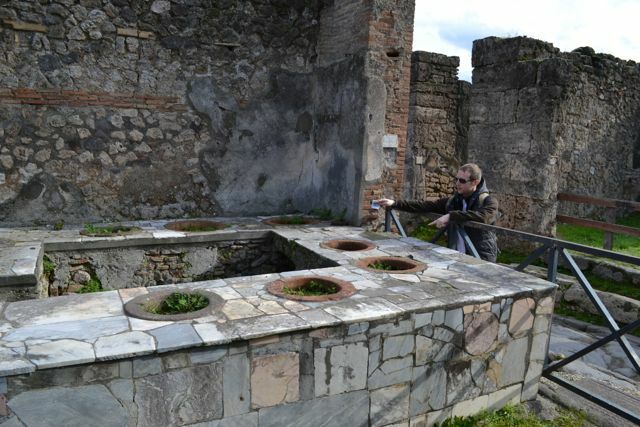 Good thing we did all that carb-loading because on Friday we had a full day of exploring Roman ruins. 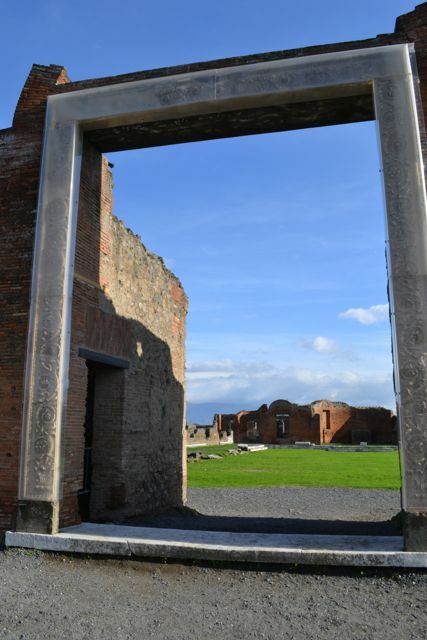 First stop was Pompeii, the top of my bucket list. January and February is the off-season for this region, so we pretty much had the place to ourselves. There was absolutely zero wait in line to buy our tickets, which contradicted our Rick Steves guide book telling us to be prepared for a 30 minute queue. 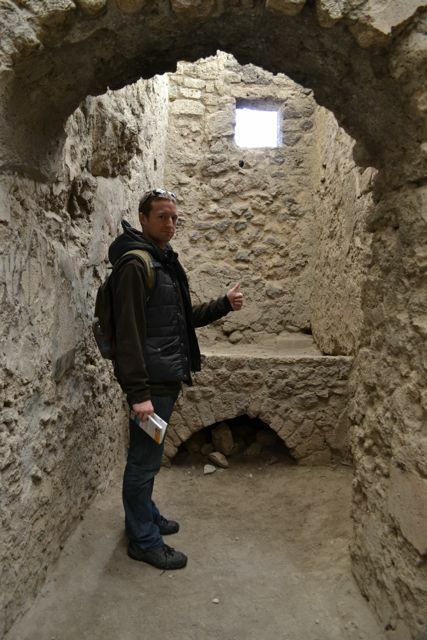 We walked right in and began exploring the massive city. 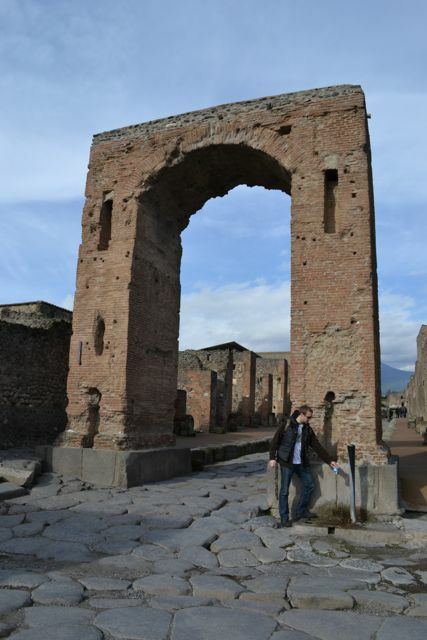 Even though I had high expectations for Pompeii, I was not let down. 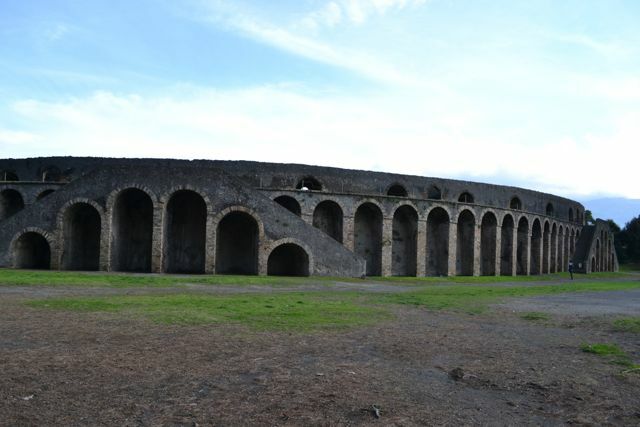 In fact, Pompeii was even more massive and expansive than I could have imagined. It was incredible to see this city with my own eyes, and imagine the people who must have lived here. This city was thriving over 2000 years ago, and it is really incredible how advanced their civilization was. 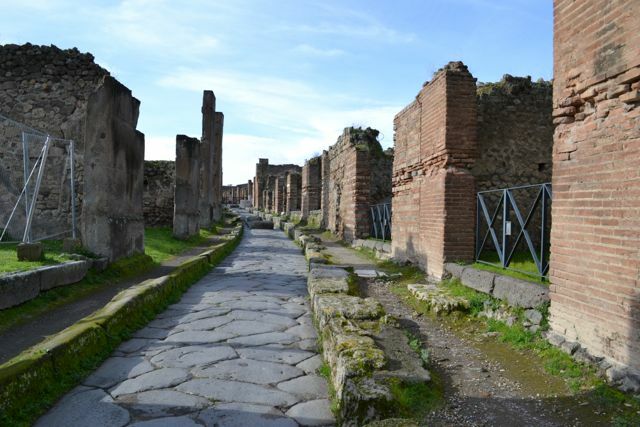 The streets were all laid out according to plan, with some roads meant for one-way traffic, others for two-ways, and still others being major thoroughfares. 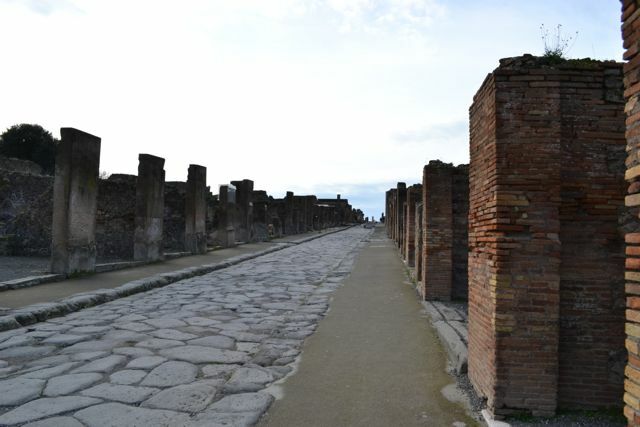 The center of town was the great forum, and it really reminded me of massive plazas that we have in the center of modern-day cities. 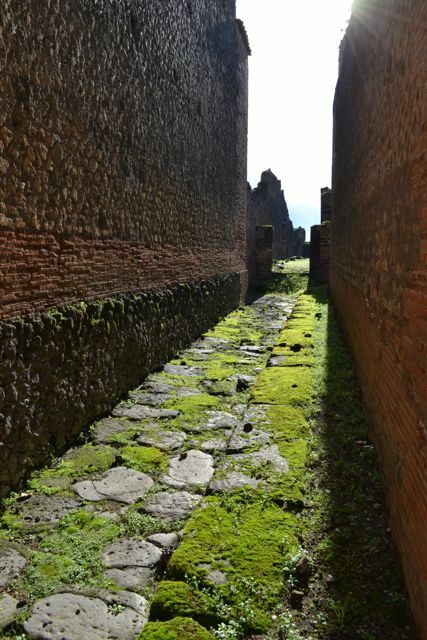 They had a network of aqueducts and plumbing, so every citizen, no matter how rich or poor, had access to running water. We were able to go into the public baths and it reminded me of how spas are functioning today. They even had fast food stalls at the corner of streets every few blocks or so. 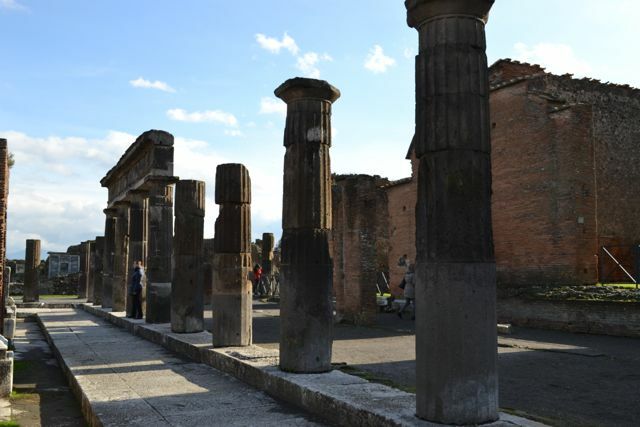 We explored a lot of Pompeii, probably spending more than 3 hours walking around, and we still weren’t even close to seeing all of it. It was truly incredible. 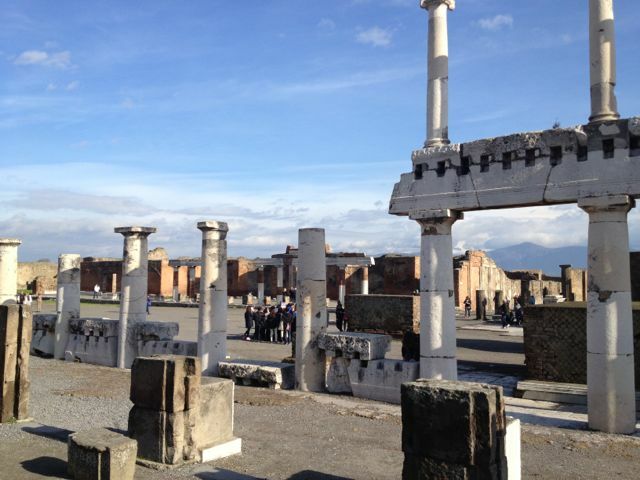 This used to be the port of Pompeii, it was right on the sea! 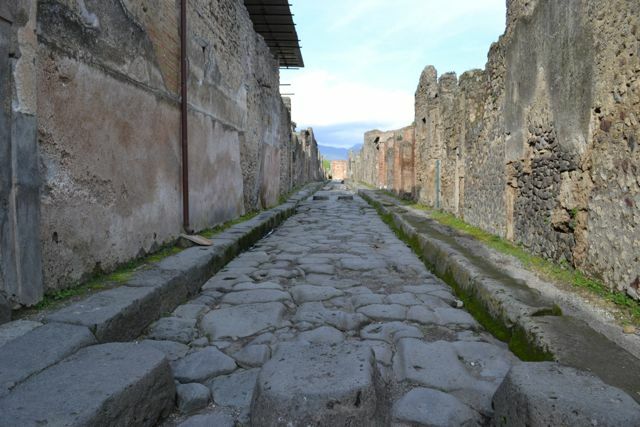 After Mount Vesuvius erupted, more land was created. 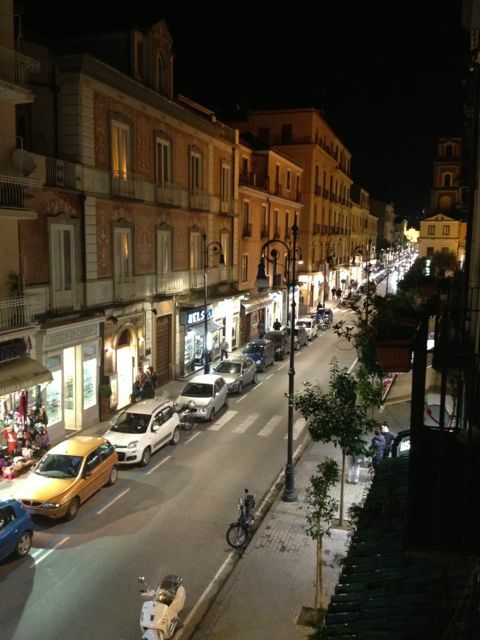 The main street – Via Abbondanza. 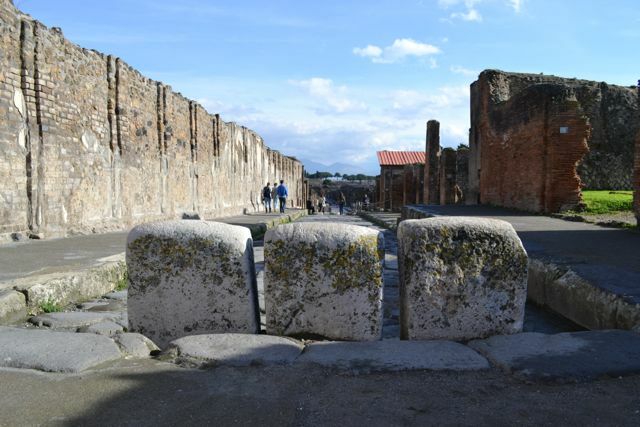 The three stones are ancient traffic barriers to keep the chariots out of the forum. Check out those walls! 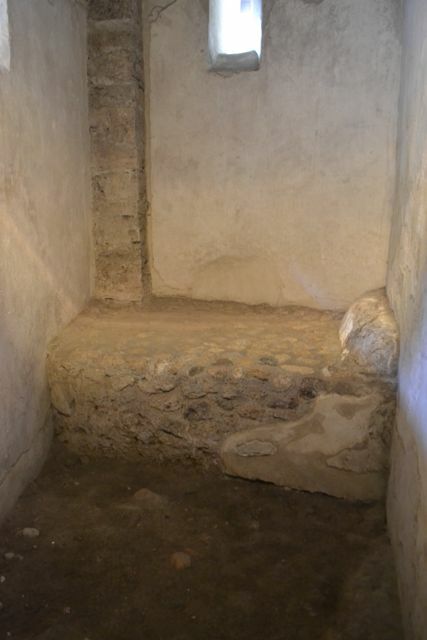 It’s incredible that has survived from 2000 years ago! 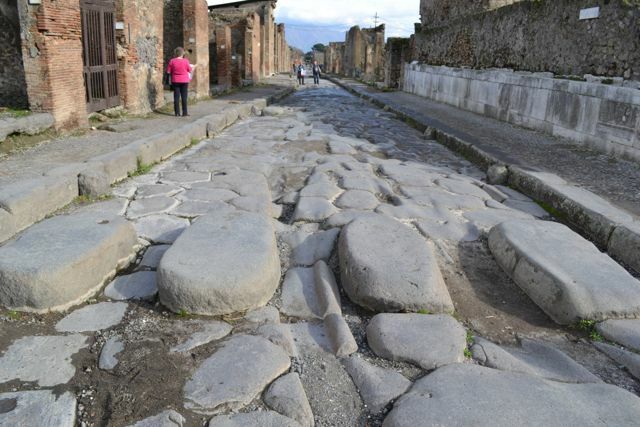 This was obviously a main street because the stones acted as lane dividers, as well as stepping stones to cross the street and not get your sandals dirty. 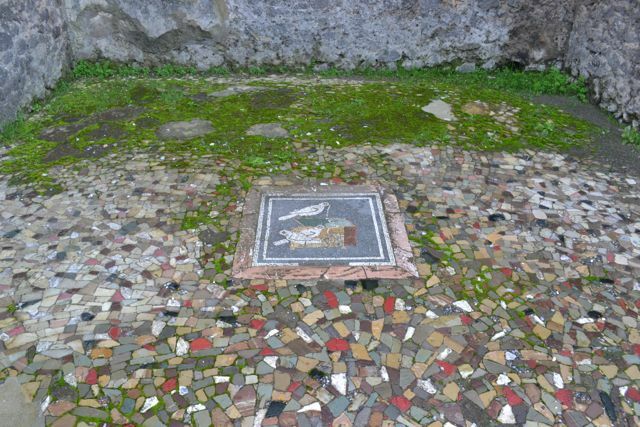 Floor mosaic. 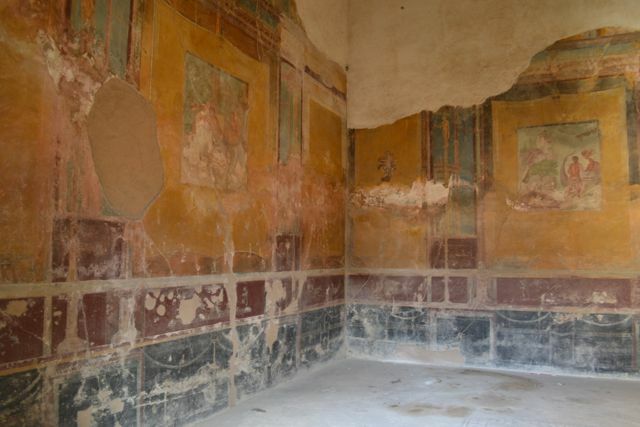 A lot of the surviving mosaics were taken out of Pompeii, but don’t worry, Lord Elgin didn’t get them! 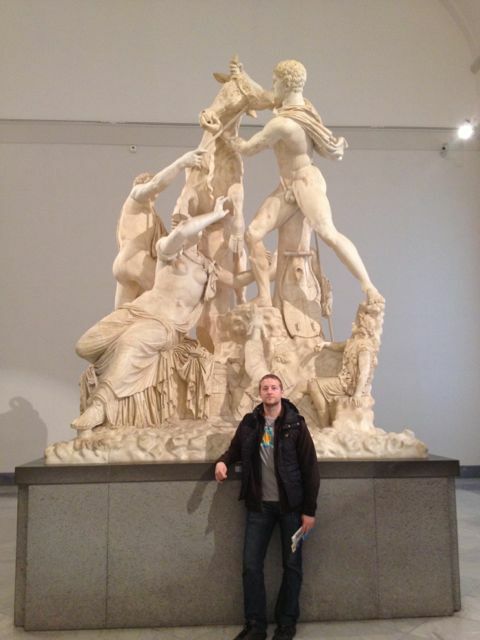 They are still in Italy at the National Archaeological Museum in Naples, where we went on Sunday. 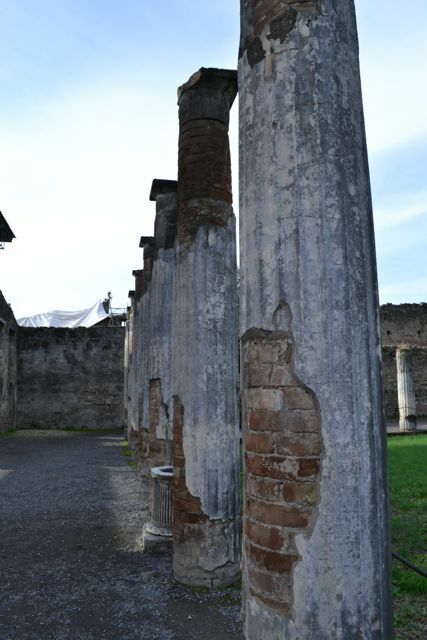 Most of the columns weren’t made with real marble, but were instead built with brick and then covered to look like marble. Genius cost-saving technique! This was literally on the side of someone’s entryway! What a greeting! 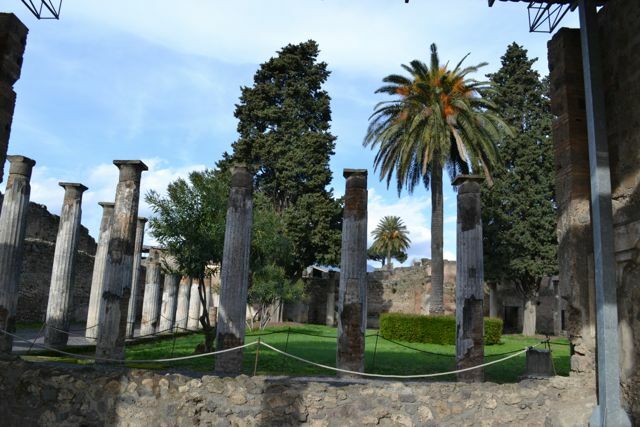 After exploring Pompeii, we hopped back on the train and headed on to Herculaneum. 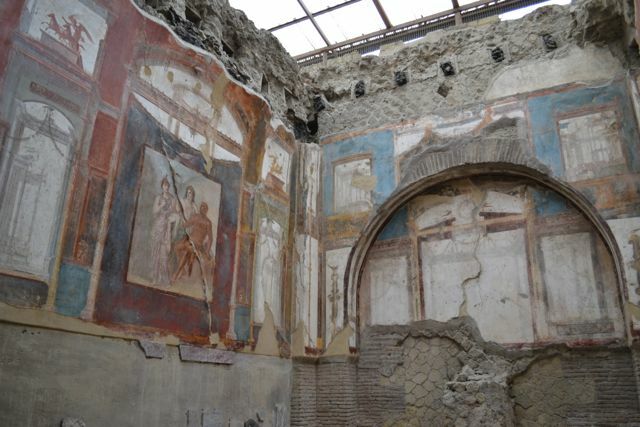 Herculaneum was also destroyed by the eruption of Mount Vesuvius in 79 AD, but it’s not as famous as Pompeii. 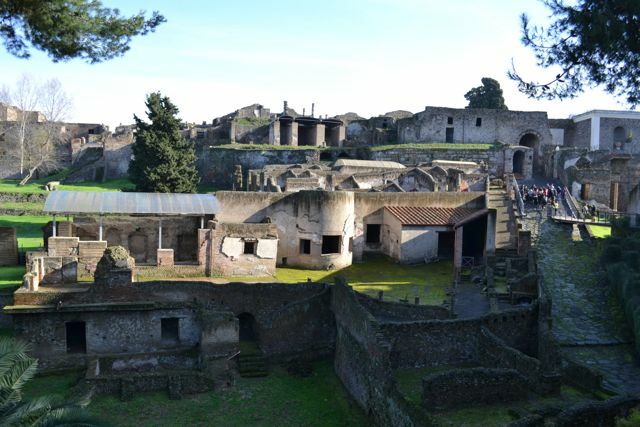 While Pompeii was the bustling typical Roman city where you could find people from all walks of life, Herculaneum was the posh, upscale area where the rich lived. 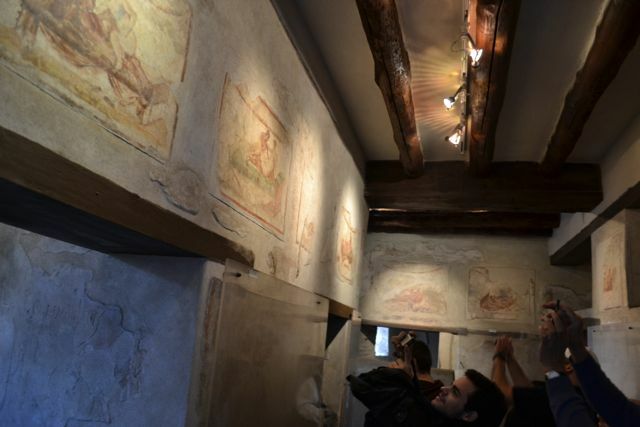 It is not as expansive as the ruins of Pompeii; however, it is better preserved. 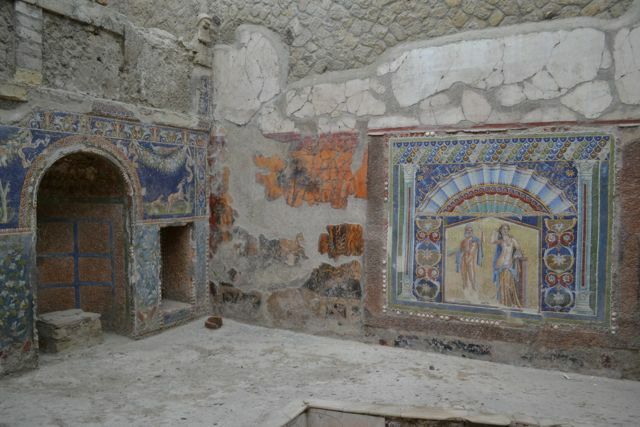 The second story of many buildings have survived, as well as more and better mosaics and statues. 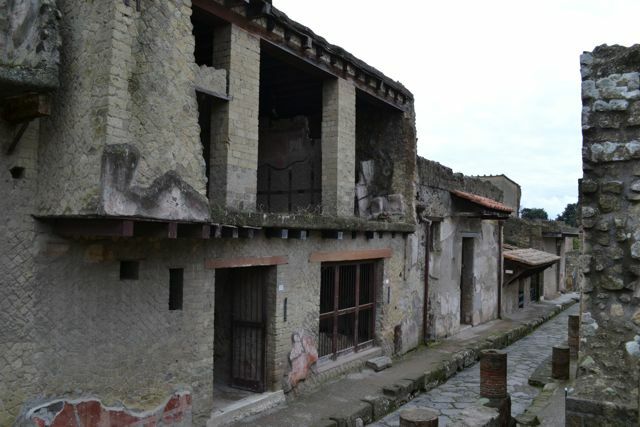 I think I’m partial to Pompeii, but Herculaneum was very interesting as well. Again, we pretty much had the place to ourselves which was really nice. 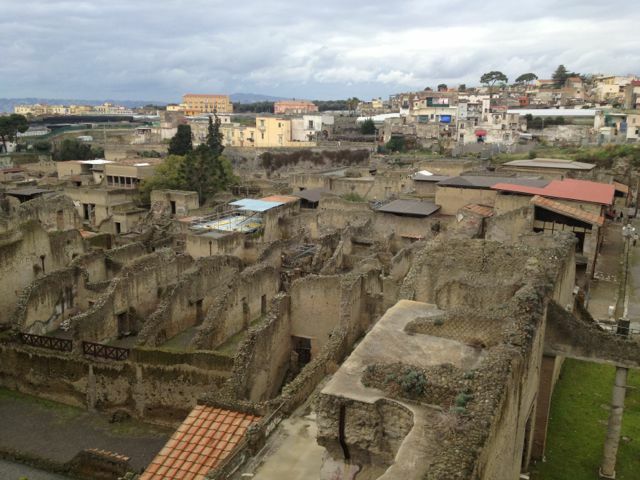 Herculaneum used to also be on the sea, like Pompeii, but the eruption of Vesuvius created more land. 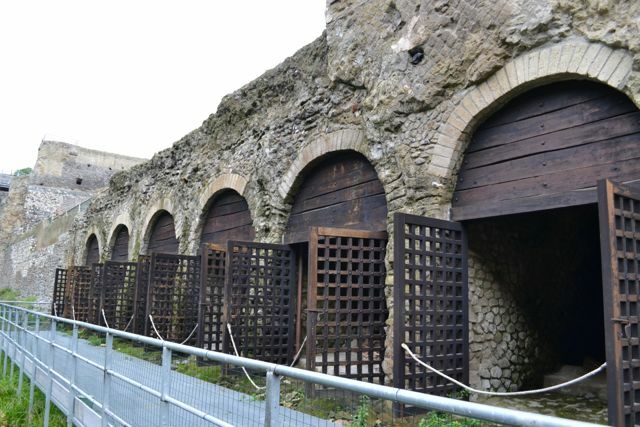 These arches are where boats were stored, and also where most of the bodies were found. After a long day of exploring ruins, we celebrated with a nice dinner at Ristorante da Filippo, which was recommended to us by a German guest at our B&B. It turns out that the German guy was also eating at the restaurant (and apparently cooking with the chef) and we shared some drinks with him and the chef after dinner. It was quite the experience and regretfully I didn’t get a picture with them. 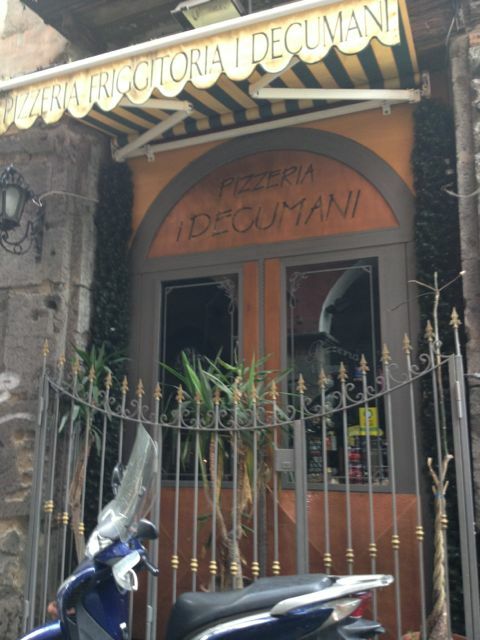 The food was excellent, although the restaurant was tucked away in the hills of Sorrento and sort of hard to find, especially since Google, the restaurant website, and the restaurant business card all gave contradicting addresses! 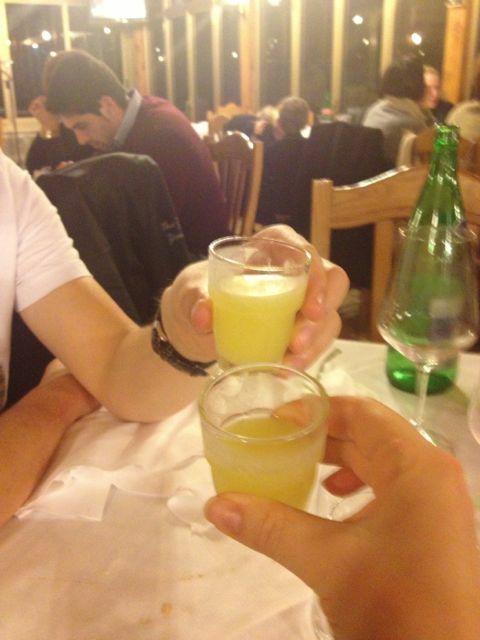 This region is famous for its limoncello, which is the perfect after dinner digestif. 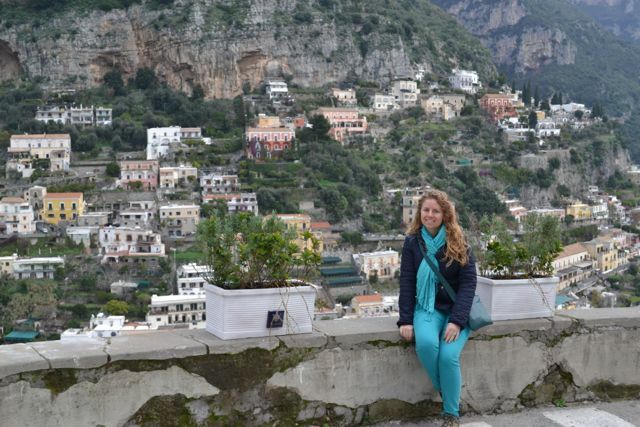 On Saturday, our plan was to take the bus all along the Amalfi coast through Positano and Amalfi, ending at the town of Salerno. 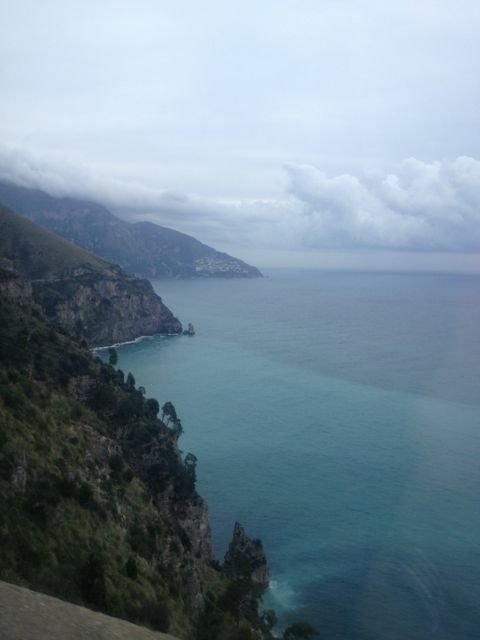 The bus journey is supposed to be one of the most incredible and dramatic in the world. 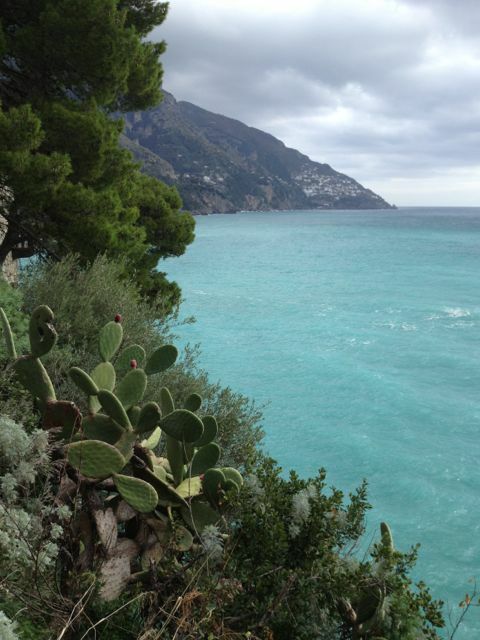 Unfortunately, the Amalfi coastal road beyond Positano was closed, so we had to change our plans some. 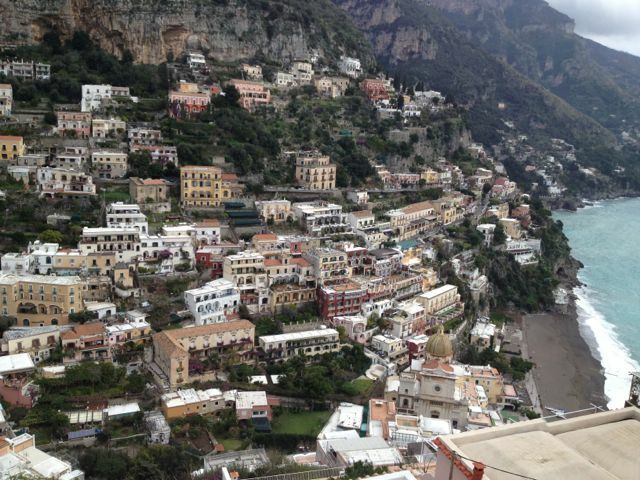 We were only able to take the Amalfi coast bus to Positano, but honestly, that was more than enough. The bus ride was absolutely terrifying. 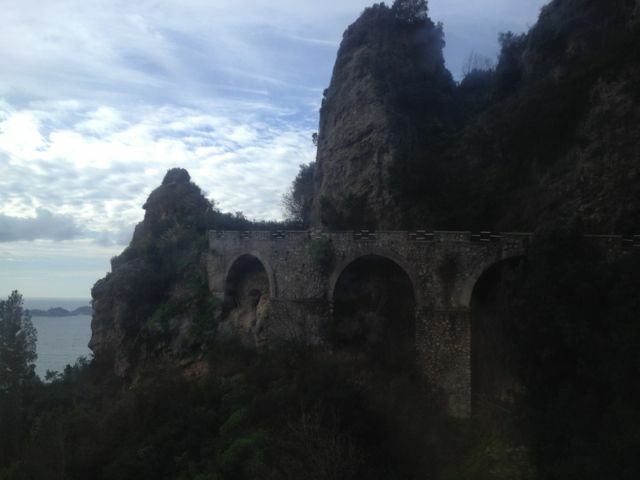 We were whipping around blind curves, with mopeds and cars speeding around us at any opportunity, all the while continually jutting in and out from the cliff. 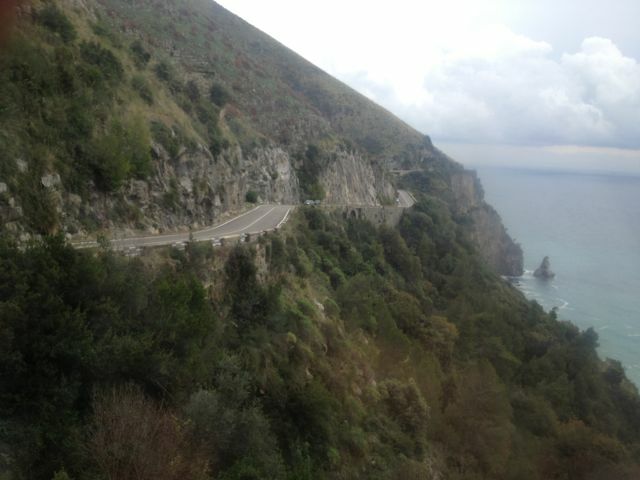 Yes, the views were incredible, but the cliff roads were terrifying. 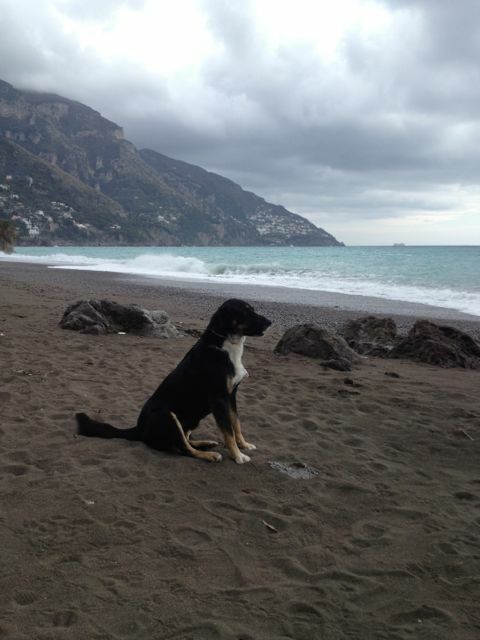 Both Doug and I were relieved that we could only go as far as Positano. 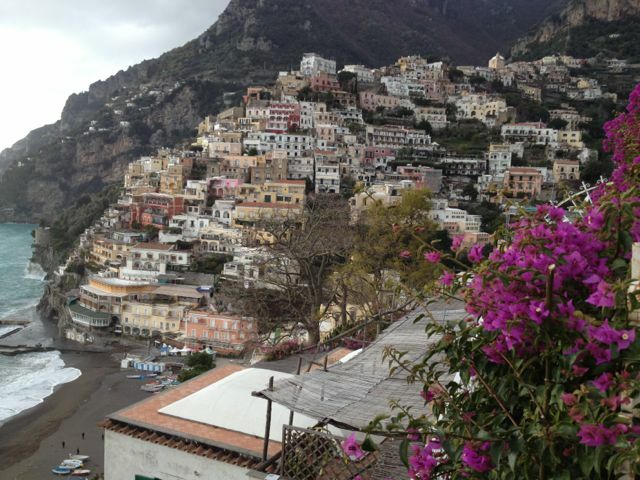 We spent some time exploring Positano, and it was very nice. 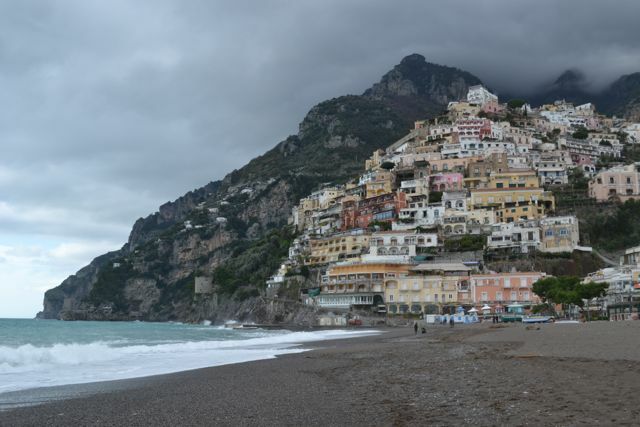 It actually reminded me a lot of the towns in Cinque Terre, since it consisted of colorfully stacked buildings hanging onto the side of sea cliff. 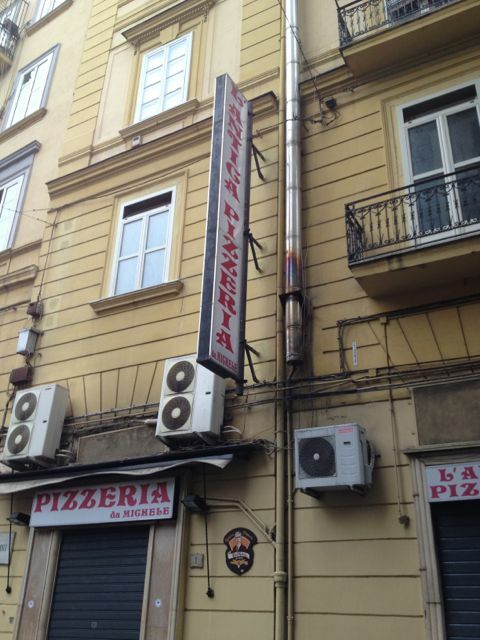 What kind of building regulations do they have in Italy? 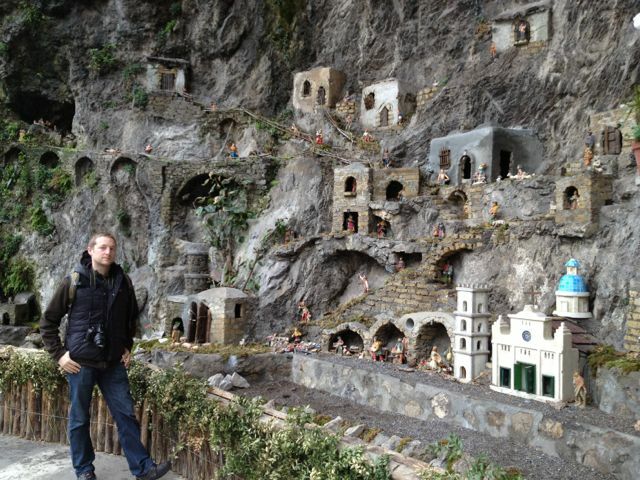 While exploring the town, we came upon this weird scale model of it. No explanation could be found. Felt the water and it actually wasn’t that cold! 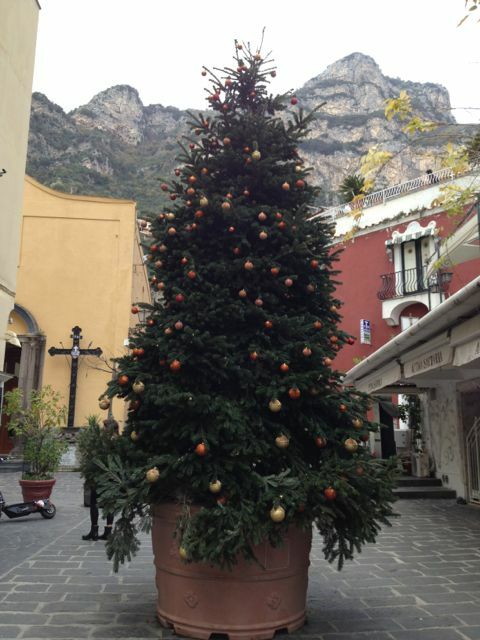 All over Italy, the Christmas decorations were still up, they just weren’t being lit. From a distance, I thought this tree had been decorated with oranges and lemons. 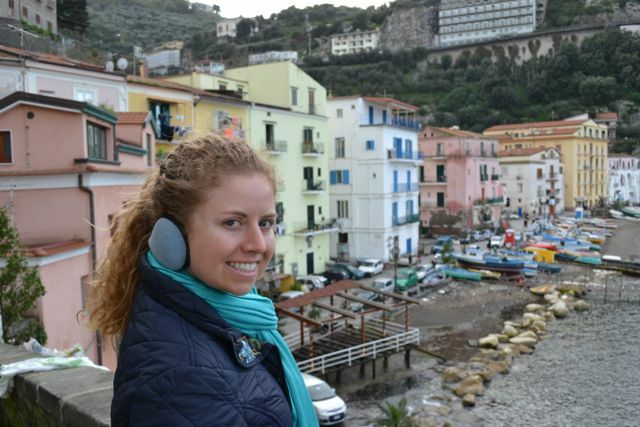 After spending some time in Positano, we survived the bus ride back to Sorrento, and did a little walking tour of Sorrento. 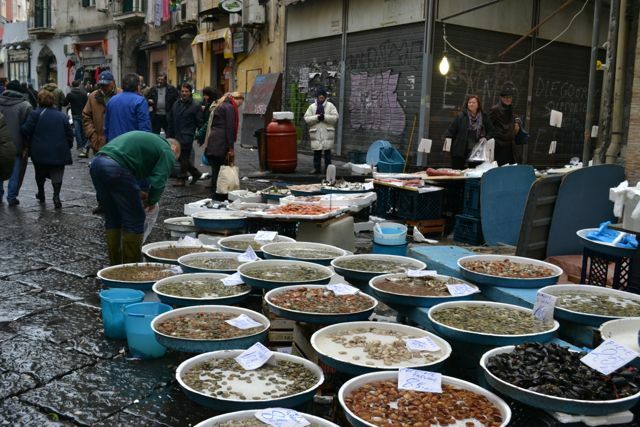 We walked through some of the main streets, the back streets, and down to the harbor. 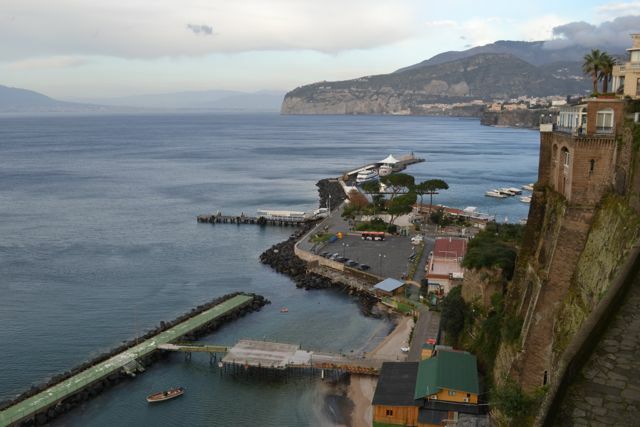 Sorrento’s other harber – Marina Grande. I like that there were actual fisherman here. The wind was picking up and it was getting colder. 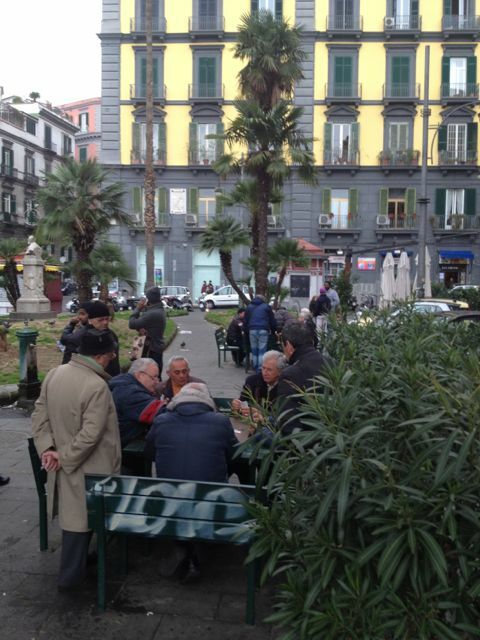 Despite warnings from many friends and family about the uncharming nature of Naples, we ventured there anyway. 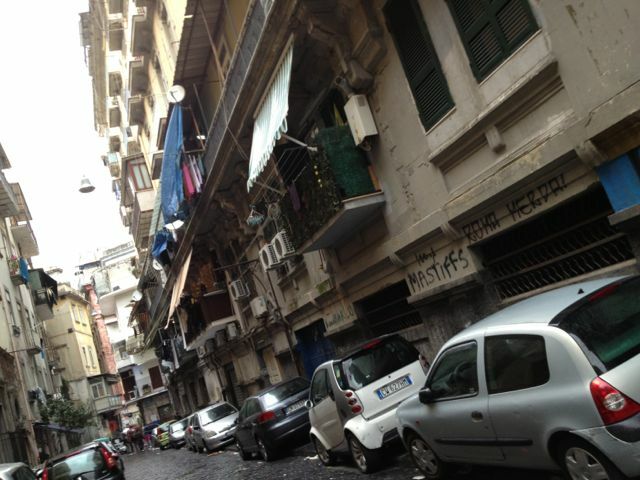 I knew to expect a dirty, poor, smelly, and dangerous city, and I think it exactly hit the spot. 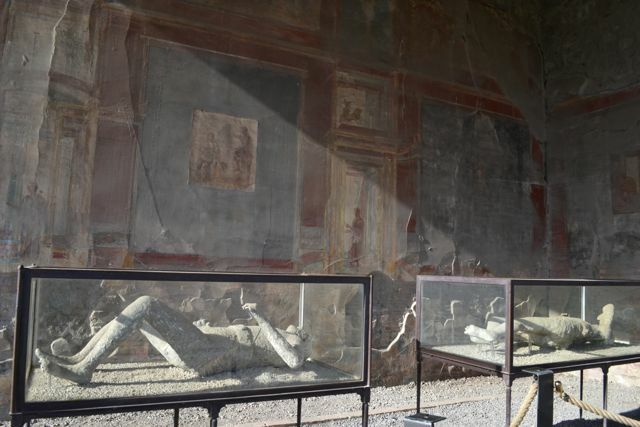 Our main goals for visiting Naples were to visit the National Archaeological Museum, which held many of the treasures of Pompeii, and to try out pizza directly from its birthplace. 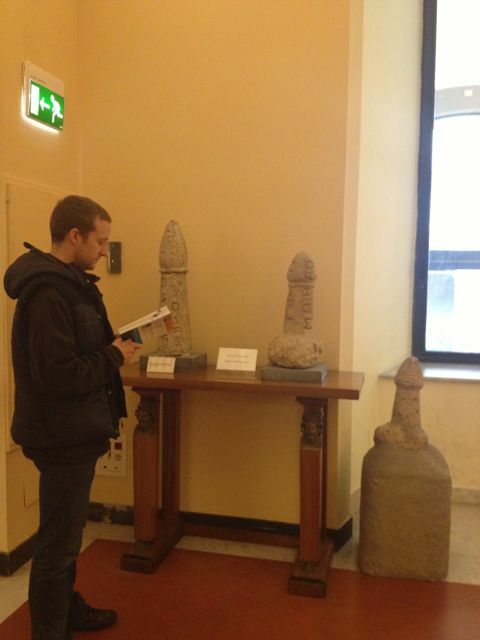 I thought the museum was pretty good. 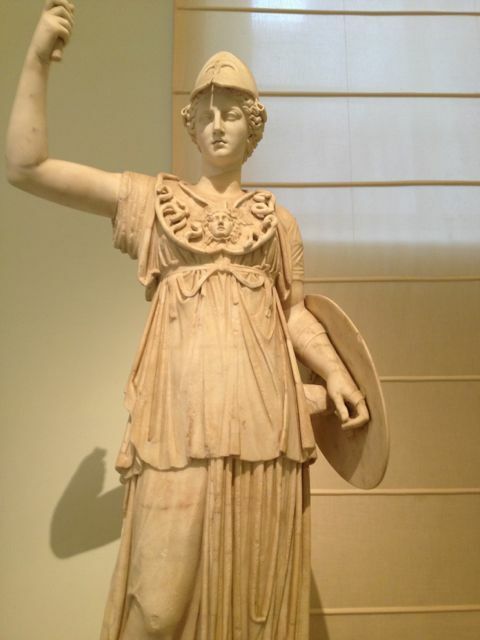 Especially since Italy has been able to keep its treasures and they haven’t ended up in the British Museum like Elgins marbles (remember that most of the treasures in Athens aren’t even there anymore). 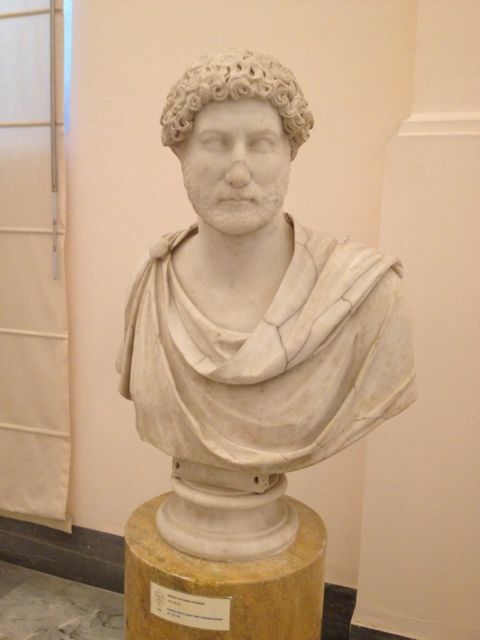 Bust of the Emperor Hadrian. 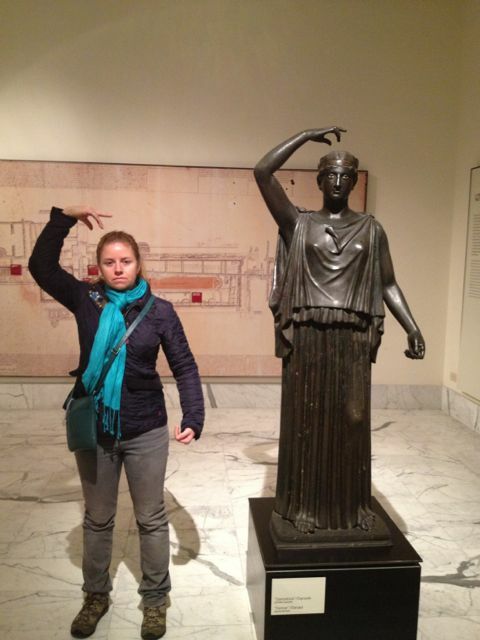 Recognized him from a similar statue in Athens. 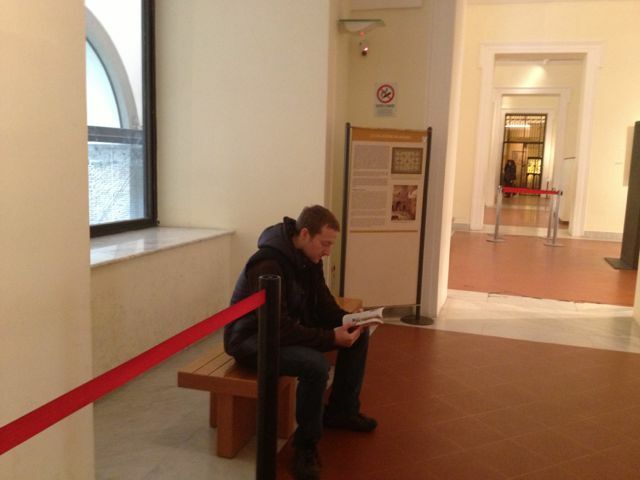 Doug resting in the museum – although he was pretty patient this time. Probably because he felt safer in there than out on the streets of Naples. 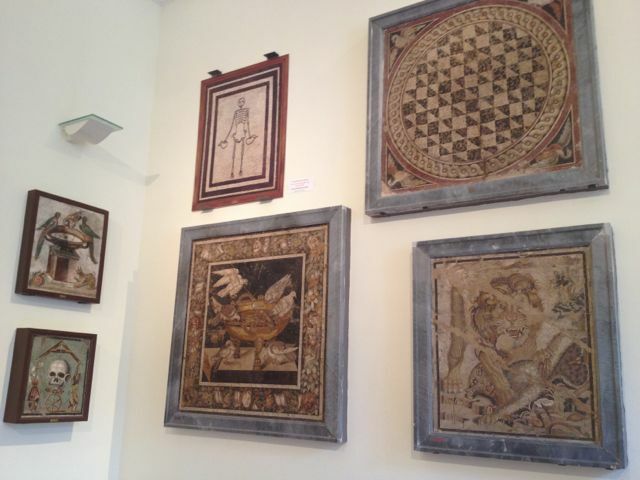 Some mosaics. I like the skull and the skeleton. 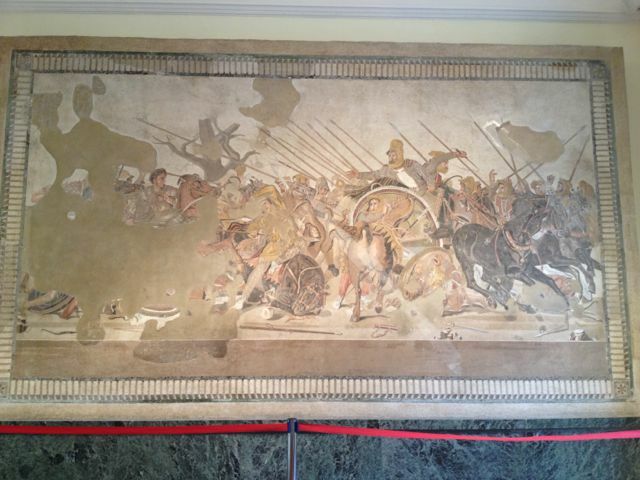 This huge mosaic was found fully intact in Pompeii and it was only ruined when they were transporting it to the museum. Not surprising after seeing how they drive in Naples. This was at the entrance to the Secret room. I won’t put any more pictures from that room for fear of this blog becoming X-rated. 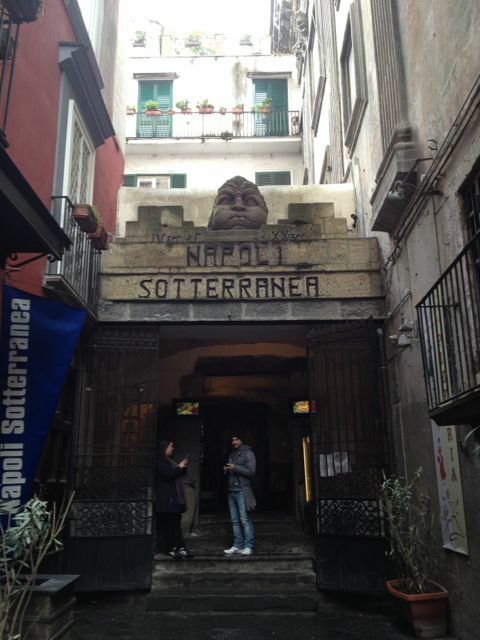 After our time in the museum, we did a Rick Steves walking tour around Naples. 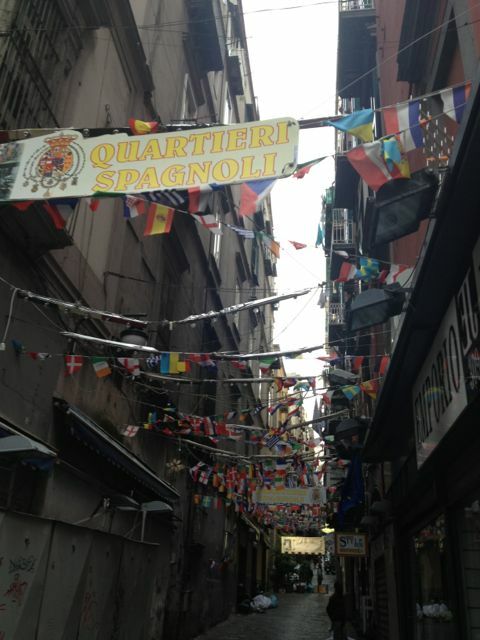 This brought us by the major sites, past the bustling, crowded Spanish quarter, and ended at the birthplace of pizza. 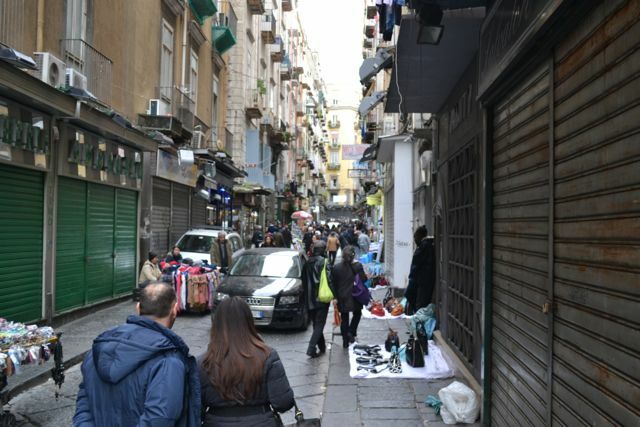 The streets in Naples were insanely crowded. Often we thought we were on a pedestrian sidewalk until a car came zooming by and we had to dive out of the way. The cars do not slow down for pedestrians, or anything else for that matter. 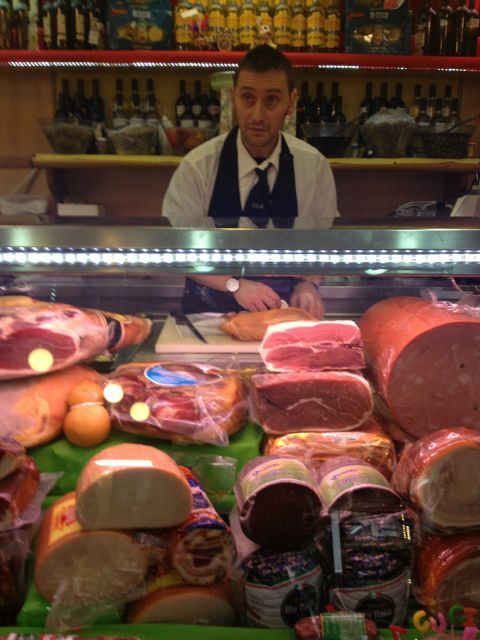 After our success with our deli-made sandwich in Positano the day before, we got another deli sandwich with more buffalo mozzarella. Success again. Honestly, I was expecting better pizza. 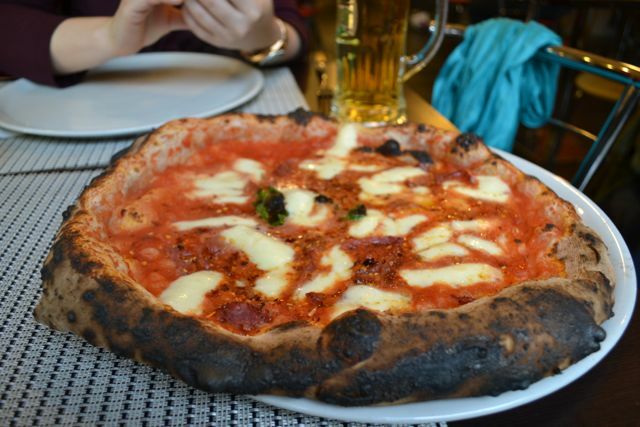 Sure, any pizza is good, but in the birth city of pizza, I was expecting incredible and it was just okay. The beer was better. 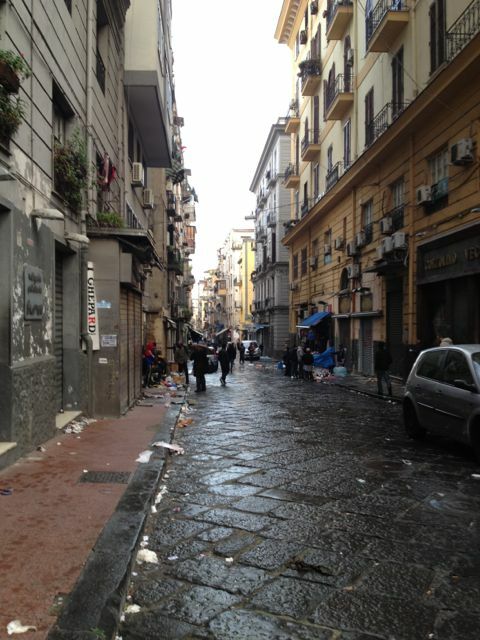 Overall, I was not impressed with Naples. 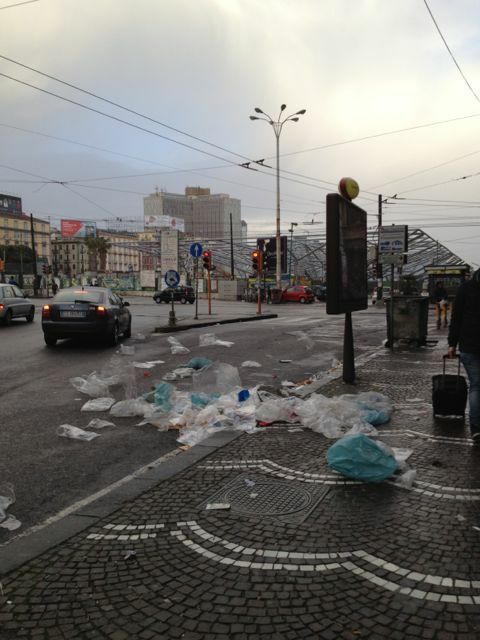 It felt dirty, trash was everywhere, there were all these funky, unidentifiable bad smells, and you couldn’t safely walk down the street. 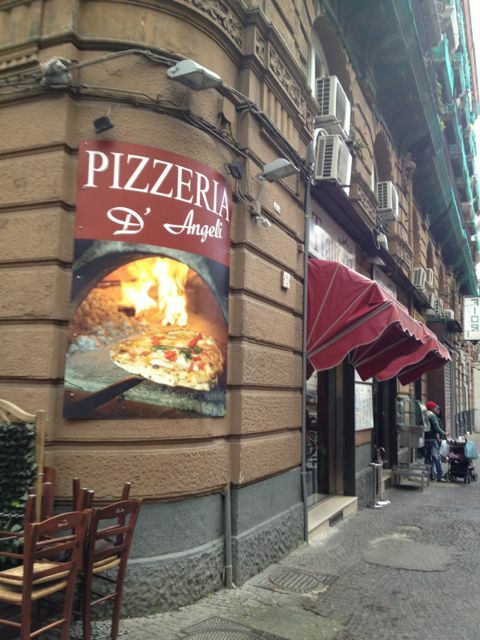 I didn’t feel the need to ever go back to Naples, not even for the pizza. 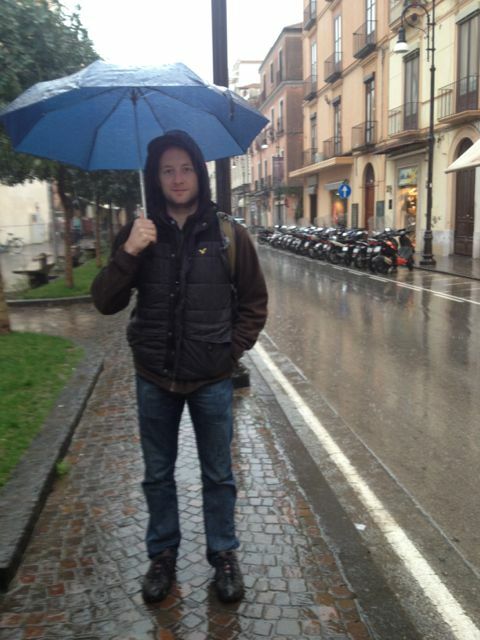 However, with some bad weather luck, we ended our trip with one more day in Naples. 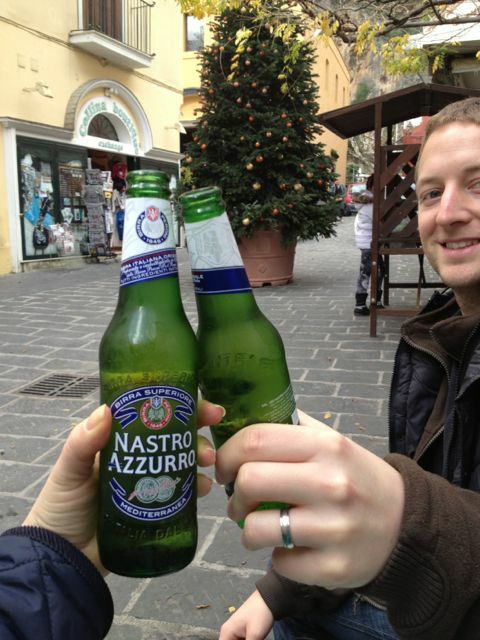 We had a great plan for our last day in Italy. Our flight out wasn’t until 5:30pm, so we planned to take the ferry from Sorrento to the Isle of Capri in the morning, spend the majority of the day exploring Capri, including taking a boat to the Blue Grotto and taking the chair lift up to the hilltop view, and then taking a jet boat straight to Naples and to the airport for our flight. However, we were awoken on Monday morning to the sound of pouring rain and thunder. We were hopeful that maybe the storm would pass, but the weather forecast said it would last the whole day. Our trip to Isle of Capri could not happen. 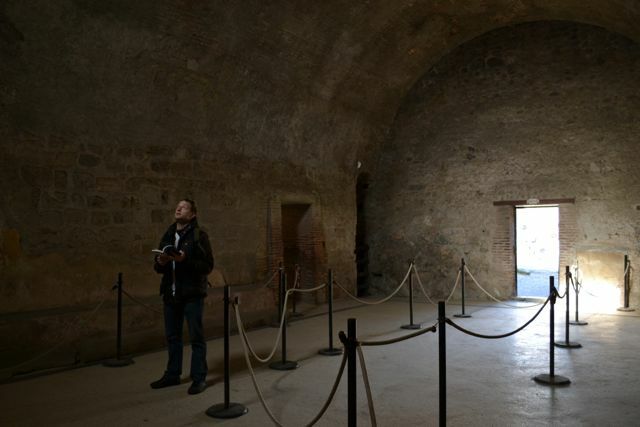 After trying to figure out what we could do in the area during a rainstorm, we finally decided to go back to Naples to go to the Napoli Sotteranea, which is an underground archaeological site with ruins from the Roman and Greek times. This activity couldn’t get rained out, and it actually sounded pretty interesting. Here is where the epic fail begins. 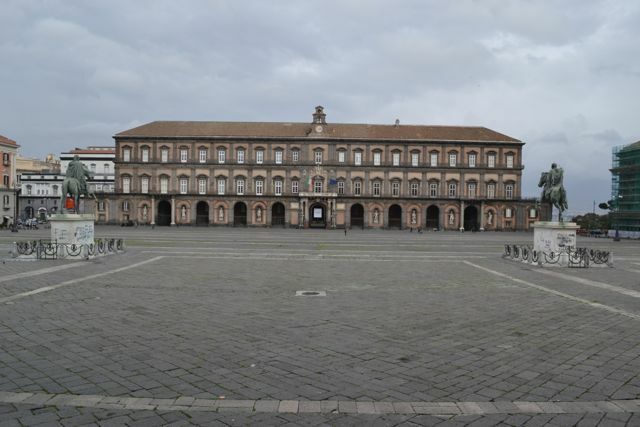 After checking the Sotteranea website, we learned that they had English tours at noon and 2pm. 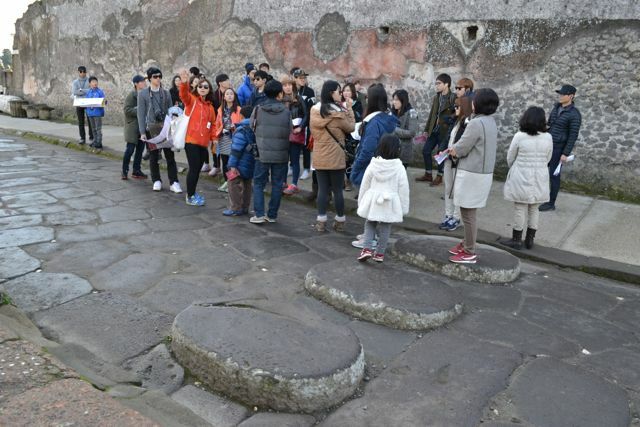 The tours lasted 1.5 hours, but knowing the Italian way, they would probably not start exactly on time, so you could expect the 2pm tour to finish around 4pm. That would not give us enough time to get to the airport comfortably, so we decided we had to make the noon tour. It was around 9:40am, so we figured this wouldn’t be a problem. 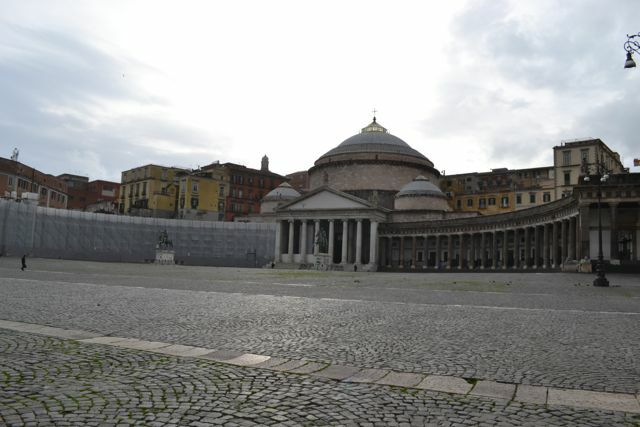 However, the next train to Naples wasn’t scheduled to leave until 10:37am, getting us in Naples at 11:45am, and then we would have to check our luggage at the train station and make our way over to Sotteranea by noon. We figured if we got a taxi, we would just be able to make it, so we decided to go for it. Everything started out smoothly. Our 10:37am train was on time, and even left on time. 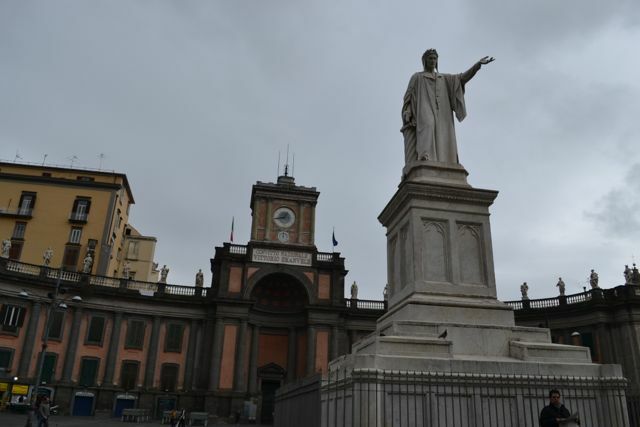 We arrived in the Naples train station on time. The baggage drop was easy to find in the train station, there was no queue, and the drop-bag-get-ticket process was the easiest we have come across. We even managed to get a taxi really quickly since they were all lined up outside the station. 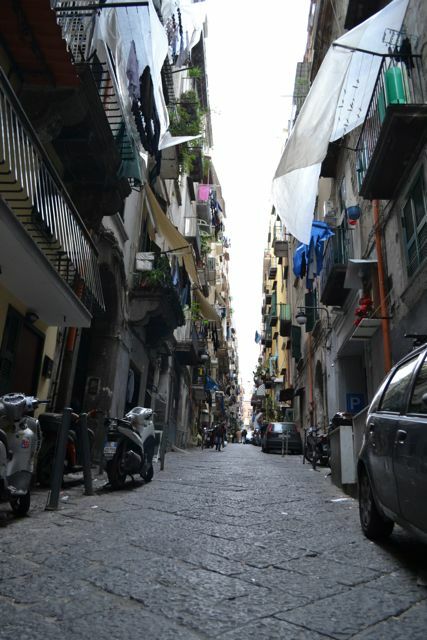 I’m not sure if the taxi driver knew we were in a hurry, or if that is just the way they drive in Naples, but it was the most intense taxi ride of my life. He was flying down little side streets, squeezing through too-small of spaces without slowing down; honking at people to move and not waiting to see if they actually did; driving into the shoulder at stop lights so that he could be first off the line and cut off the rest of the traffic. It was truly insane. And guess what!?! He got us there by 12:05, just 5 minutes after the scheduled tour time! 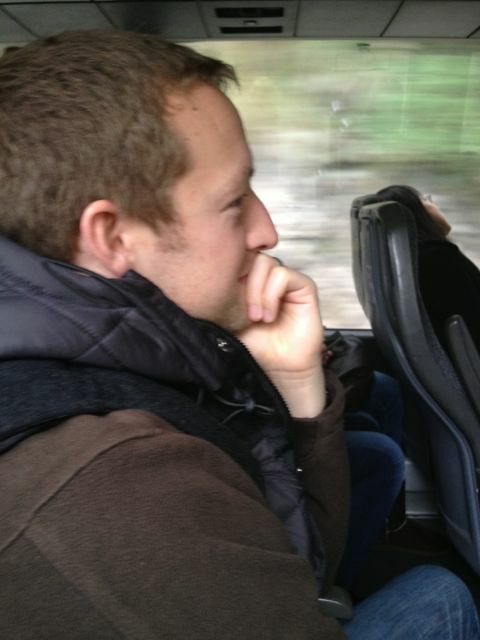 Too bad he charged us 20 euros for a 10 minute, 2-mile ride, but we didn’t have time to argue with him. 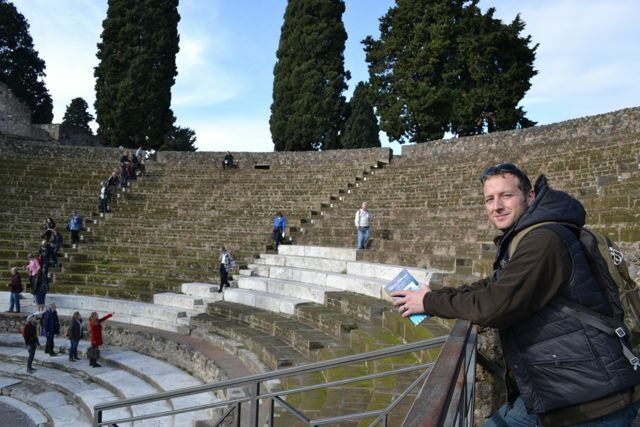 We went running in to Sotteranea, and luckily, there was still a queue of people buying tickets! We had made it in time! But wait – no – we were informed that this tour was in Italian. The English tour would be at 2pm. Fail. 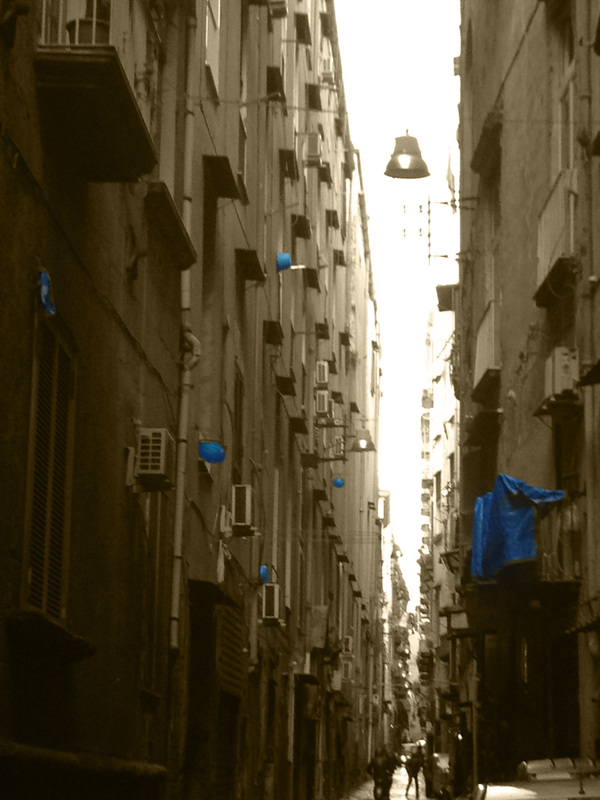 With our spirits crushed, what were we to do in the stinky, dirty Naples? Pizza and beer, of course! 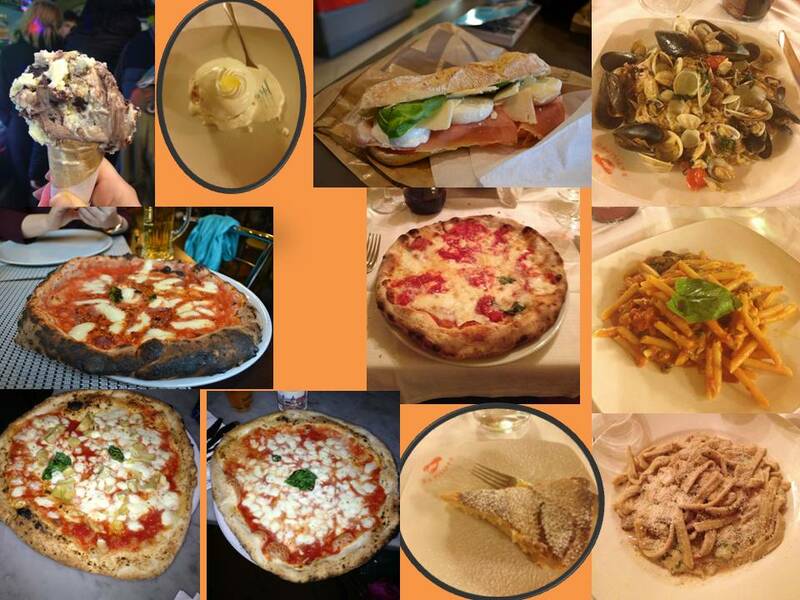 My Italian friend had told me of a couple good pizza places in Naples, and we were pretty close to one of them, so we went to check it out. Fail again. It was closed! What’s with all the pizza places that we want to try being closed? No matter, we easily found another place serving pizza, and it was much better pizza than the day before, but I still wouldn’t say it was the best I’ve ever had. After gorging on pizza and beer, we decided to collect our luggage and make our way to the airport. Not a great way to end our Italian adventure, and to end our mainland European adventures, but it will probably be more memorable this way. We’ve got one more trip to London, and then that’s it for our travel adventures. We have our flights booked to return to Indianapolis at the end of February! We’ll try to write some summary blog posts at the very end. 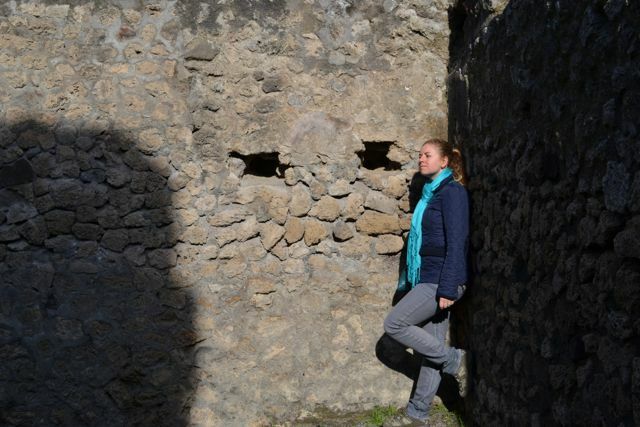 This entry was posted in Italy, Uncategorized and tagged Amalfi coast, ancient ruins, aperitivo, archaeology, Beach, buffalo mozzarella, bus, Capri, Cerberus, Circumvesuviana, cliffs, dog, eruption, Herculaneum, Italy, Latin, limoncello, Mount Vesuvius, Naples, pizza, Pompeii, Rome, Sorrento, Sotteranea, train, volcano by tgtexasgal. Bookmark the permalink. What an awesome trip!!! I envy you two!